Here's Heidi's cute calendar page for July! Don't you just love that cute cow and little boy image that's been fussy cut and popped up on foam tape? This reminds me of a good old country fair in July with the red, white & blue quilt with stars in the background and the cow representing a 4H entry! Great job on this month again Heidi, and thanks for the gift that keeps giving all year long! Here's this weeks mid-week throwdown card for OWH Stars & Stamps which is a color challenge of kraft, red, white, & blue. The sentiment is from CASual Friday stamps stamped with PTI enchanted evening, and the frame was done with SB square dies. Embossing was done with a Hero Arts/Sizzix ef, the bricked pattern border was done with an EK punch, while the little stars were done with a SU! punch, and the large star was done with punch-bunch. Here's my card for this week's OWH Stars and Stamps sketch challenge #179. I used some assorted dsp's from my scrap pile, along with some cream, blue and wine-colored card stock scraps. The sentiment was done with 2 SU! sets - Label Love & a Round Array and 2 SU! punches - the Artisan Label & 7/8" scalloped circle. Ribbon by Pizzazz Aplenty, glittered brads from Glitterazzi. That's going to be it for me today, but as always, I thank you for stopping by! Fantastic card for OWH mid-week challenge. 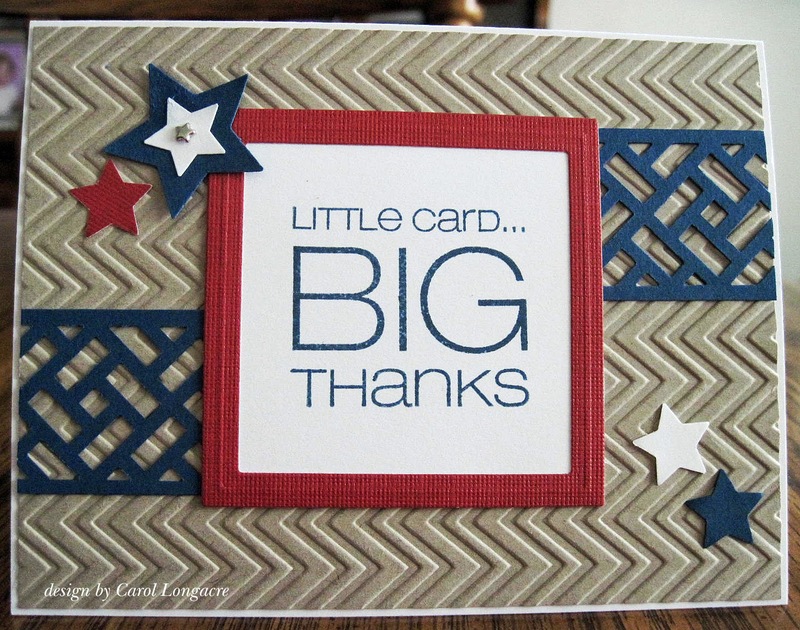 cute boarder you divided up, great texture...thanks for sharing. Heidi's calendars are so amazing. Love this one!! Love all of them. Great sentiment on the second card and the card is awesome. Very pretty thank you card. That scrap pile must really be going down. Have a wonderful 4th of July. We're getting rain. Yuck!!! Great cards, Carol, Hope you enjoy your holiday tomorrow. Another great calendar month! 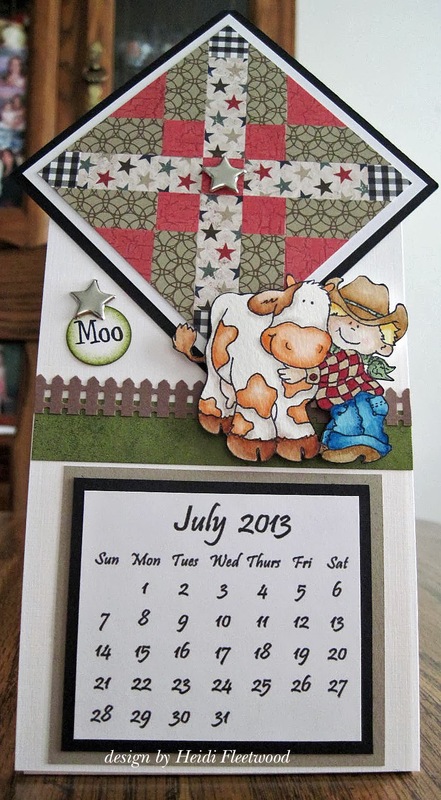 Love that little boy and cow image - too cute - and it really does remind you of a good old county fair! Both of your cards are wonderful! Love that first one with the Kraft and that yummy embossing folder you used in the background. Great design on both of these! Wow, over the moon again with Heidi's calendar page. Her pages just amaze me. I love your cards. 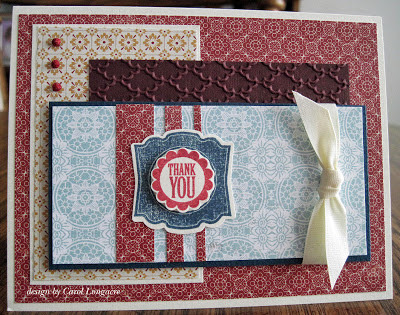 That is a great sentiment on your second card and I love the die piece against the chevrons. Your third card is very pretty. Love the papers with the wine card stock. Enjoy the 4th my friend. 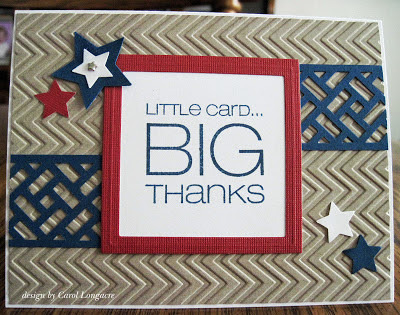 Great card for the OWH challenge, I love the border & the greeting is just perfect!!! Great group of cards, but I SO love the chevrons one the little card big thanks one - I NEED that stamp!!!! The calendar is so sweet- great image! The sentiment on the middle card is fabulous! The 3rd card is so elegant- love the layering of the sentiment! Wonderful as always!! Another amazing post. 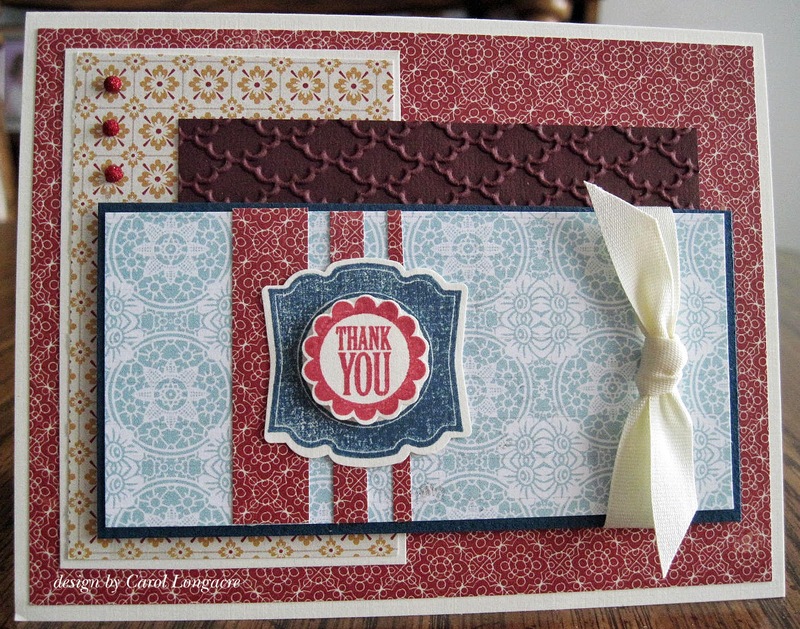 Love how you paired the embossing with the border punch on your OWH card -- a fabulous effect! Wonderful stuff here! That calendar is wonderful - she is very talented. Your cards are wonderful too - I so love that sentiment on the first one - super fun. Lovely work as usual my friend. Hugz! You make such wonderful cards for OWH. You seems to find just the right sentiments1 Great cards. Loved this card the first time... love it even more the second. You are so talented. Wonderful cards and calendar! Great example on the OWH Sketch Challenge today. Love that brick punch. great card! love the texture and movement. colors are good too! love the sentiment. Lovely Work! I saw your card in the OWH post and wanted you to know that I think it's pretty awesome! I just love your card for this week's OWH sketch. The punched strips add such a beautiful design to your card. I decided to make a patriotic thank you card as well for my take on the sketch. Thank you for the wonderful inspiration! Thanks for sharing your terrific cards and calendar.